Take the maximum Mexican dosage & explore it all, with a dash of Belize & Guatemala in the mix to keep things fresh. It is jam packed full of culture, flavours & World Heritage sites… our experiences will have your Instagram updates going out of control! 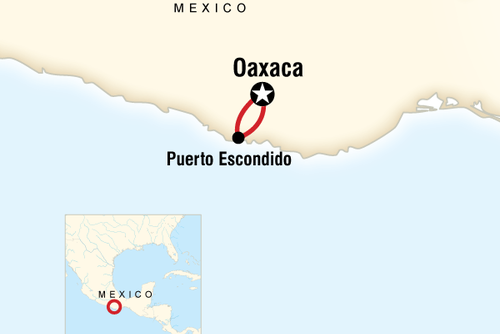 Experience the most famous monuments of the ‘Pearl of the West’ as locals refer to Guadalajara. Take a closer look at beautiful buildings and picture perfect plazas; let your Local Guide talk you through the great murals, colonial architecture and colourful history. Stroll through the streets of the historic centre, where you’ll visit the four main squares, venture inside the City Hall and the magnificent Cathedral. Admire the rich neo-classical architecture of the buildings before hitting the modern side of the city. Get ready for some Mariachi! We head to the Mariachi Plaza for some of the best music in Mexico! Mariachi is a recognized symbol of Mexico throughout the world. For Mexicans it is the musical accompaniment to life's most important moments: it forms a vital part of courtship and family events such as weddings, birthdays, baptisms, and funerals. This is the emblematic sound of Mexico, which reaches into the hearts of its listeners evoking the history and traditions. Later, head out to some of the city’s best bars & clubs to continue the Mexican Fiesta! This is an updated itinerary. Due to unforeseen circumstances, there has been a change to the original itinerary on days 1 to 7. For further details, please contact our Reservations team. Today, it’s a total change of scene when we leave behind Mexico City and fly to the beautiful white-stone city of Merida. Laid-back and pretty, it’s perfect for a wind down after the hectic hum of the capital. Get a real feel for this small, stylish town on our walking tour through the center as your Tour Manager gives you the story behind the haciendas, palaces and gorgeous buildings. We'll ride through town old-style on our included horse & carriage ride. The local driver will show off Merida’s core spots as you sit back and soak up the atmosphere. Use your free time to explore the buzzing market district, where you can pick up handicrafts, hammocks and traditional travel treasures like ponchos and sombreros. We kick start the day with a trip to UNESCO World Heritage-listed Chichen Itza – the best preserved and most famous Mayan ruins in Mexico. 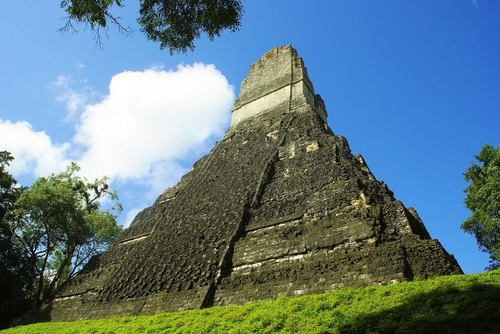 Hear from our expert Local Guide about the time temples and how the Mayan calendar worked as you explore the spectacular ancient ceremonial center and the fascinating snail-shaped observatory. Back on the coach, we continue on to glitzy Cancun, Mexico’s super resort. This party paradise is a high energy destination, loaded with outdoor activities and a buzzing nightlife. Use your free time to relax with an evening siesta. Then head into town to the Mercado 28, a lively market serving up homemade foods. Sit yourself down in a fondita (little café) and order various specialties from throughout Mexico or try the regional Yucatan dish, chicken pibil (chicken in a special marinade). For some live, local music, make a move to Parquet de las Palapas with some friends. Grab a cold cerveza (beer) from one of the food stands and take it all in. Then explore what’s on offer party-wise in Cancun. 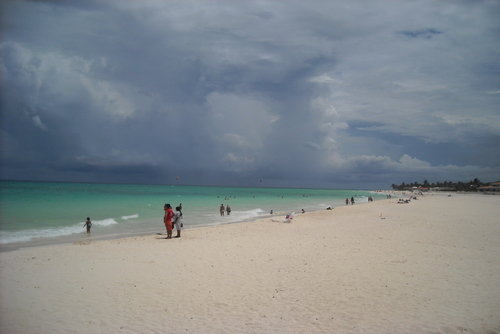 Take a trip with the group to the hip, hot beach of Playa del Carmen. 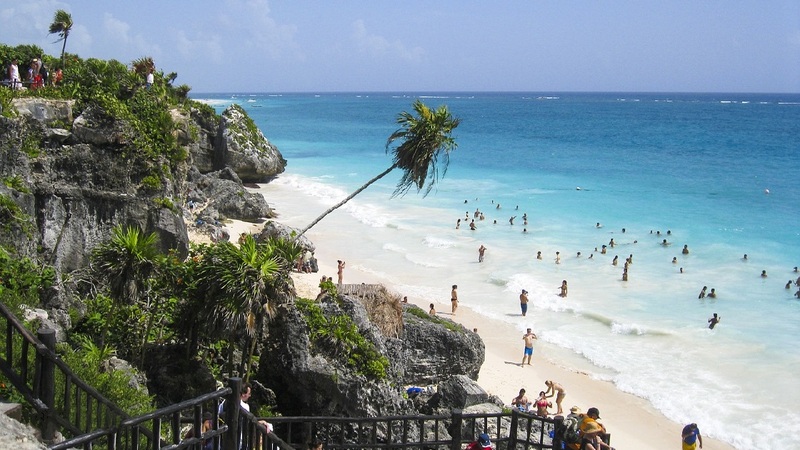 A popular spot for snorkeling and diving, Playa del Carmen has underwater caves and mind-blowing offshore coral reefs. Take a swim in the azure waters, chill out on the beach or even jump on a ferry to the Island of Cozumel. 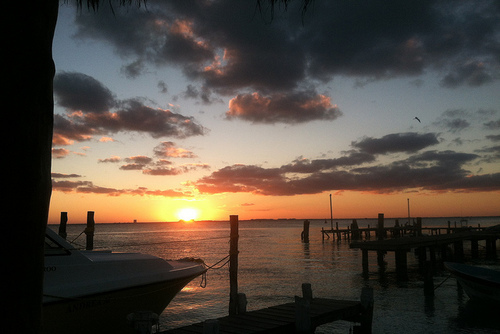 Back in Cancun, wrap up the day on the beach watching the sun set over the Caribbean Sea. Some ideas for dinner include hitting an open-air restaurant for some fresh seafood or heading to the central plaza for some authentic island specialties. Today, your Trip Manager will take you to hidden spots and show off tropical jungle and watering holes. Then with a full free day, make the most of Cancun’s action and crystal clear waters. 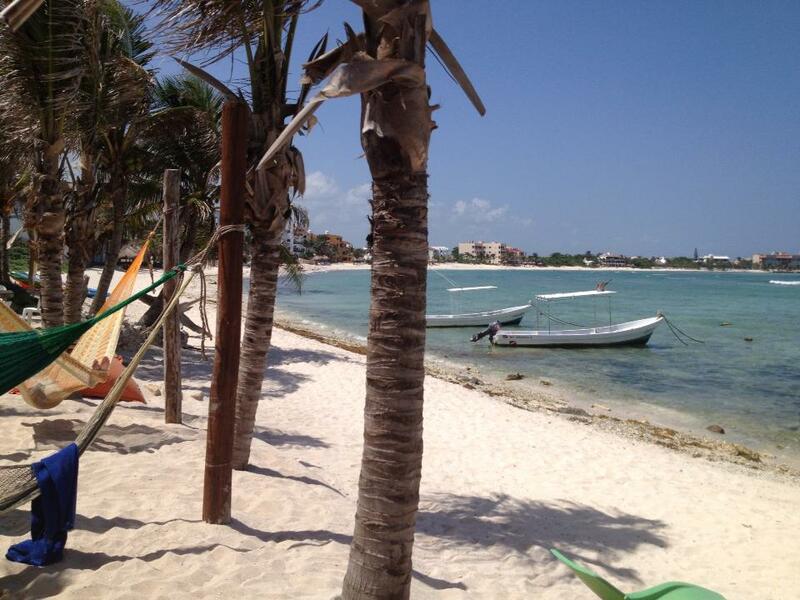 We get away from it all and head to the pint-sized Isla Mujeres. With no cars and little development, this is the place to wind down on pristine beaches and soak up the sun. 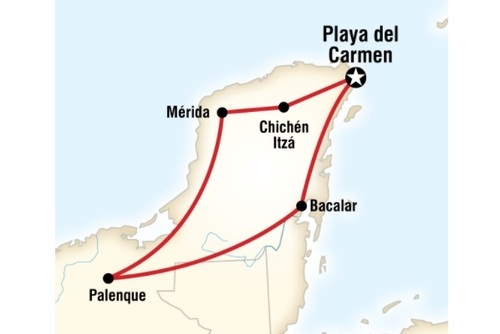 Experience its fabulous coral reefs on our optional Garrafon Natural Reef Park excursion. If you’re keen, you can even swim with dolphins here. 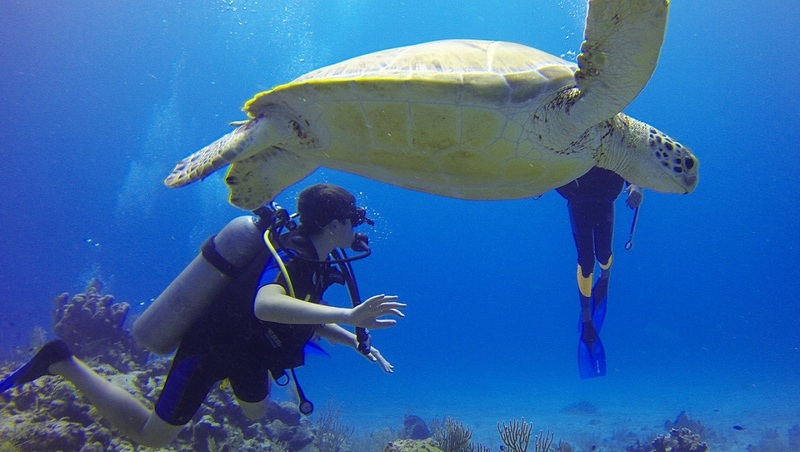 You could head to Punta Nizuc for some more snorkeling. For something different have a look through La Casa des Artes Mexicanas (House of Mexican Art), where you’ll see musical instruments, handmade kids’ toys and traditional costumes. Opt for a trip to Xcaret Ecopark, where Mayan ruins, a stunning inlet and jungle combine to make this place so special. Have a swim in the underground river and see colorful birdlife and a butterfly farm. Later why not get into the fun, festive vibes of Cancun and settle in on an open terrace beachside or at a small, local bar. Keep it moving until the sun comes up if you want – Cancun nightlife is the stuff of legends.